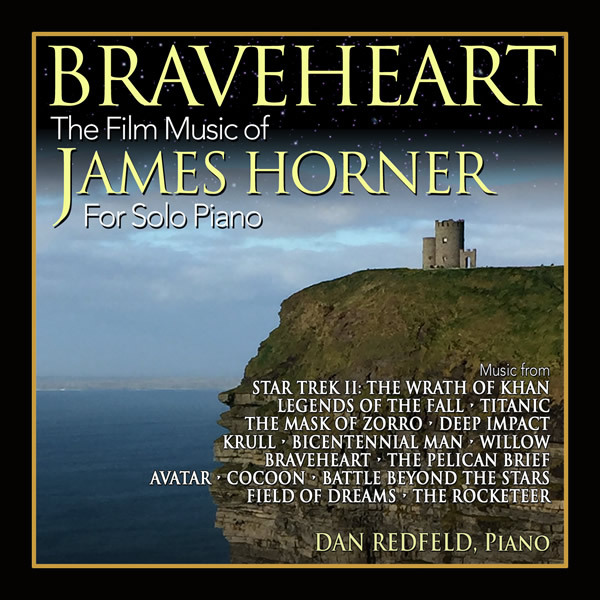 BuySoundtrax Records is pleased to announce the release of BRAVEHEART: THE FILM MUSIC OF JAMES HORNER FOR SOLO PIANO, a compilation of newly produced recordings celebrating the work of one of the modern giants of film music. With this new album, Redfeld hopes to uncover the talent and craftsmanship of James Horner as revealed by the reinterpretation of his orchestral film music into the simplified, organic medium of the concert piano, and that listeners can thus gain new insight into the composer’s craft. “Doing albums like this has been a great learning experience for me to examine the work of composers whose skill I’ve respected and whose music I’ve loved,” he said. “For me, it’s about how I can honor James’s music in a way where you can still see the structural integrity of his music, even when reduced in form to be played on a piano. 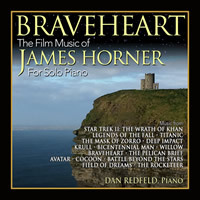 BRAVEHEART: THE FILM MUSIC OF JAMES HORNER FOR SOLO PIANO is an excellent overview of James Horner’s career and includes music from STAR TREK II: THE WRATH OF KHAN, LEGENDS OF THE FALL, TITANIC, THE MASK OF ZORRO, DEEP IMPACT, KRULL, BICENTENNIAL MAN, WILLOW, THE PELICAN BRIEF, AVATAR, COCOON, BATTLE BEYOND THE STARS, FIELD OF DREAMS, THE ROCKETEER and BRAVEHEART. The album contains liner notes written by author Randall Larson providing insight into the history of the music and the composer with insight from Dan Redfeld into the creation of these new performances.